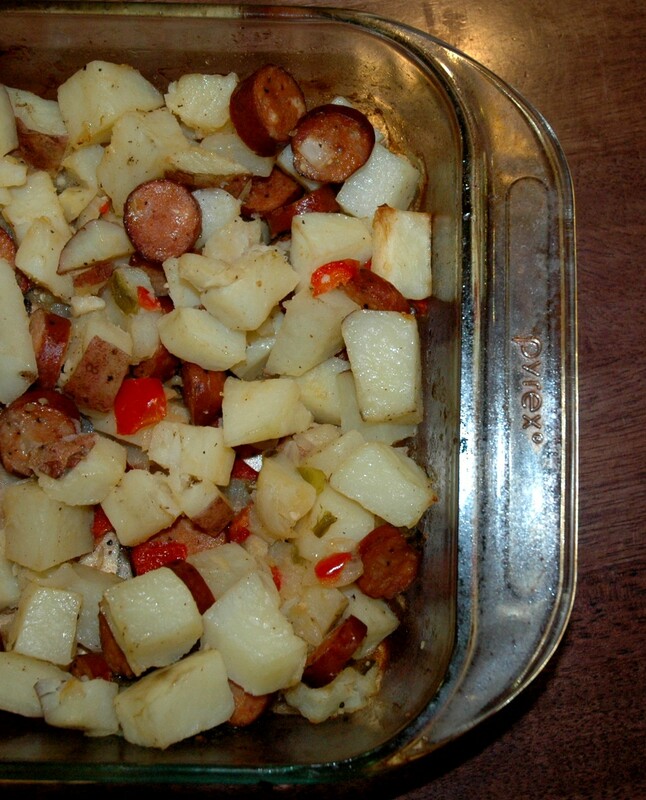 I love this sausage and potato bake because it's really fast and easy. It's really simple, but flavorful. Just sliced up sausage, potatoes, peppers and onions drizzled in a little olive oil with a few spices and baked. I've made it several different times and I've prepped it different ways. One way is to boil the potatoes before baking them with a little bit of chicken broth. And the other way is slicing everything up and tossing it together raw and roasting it. I really like chicken sausage that has a little flavor. 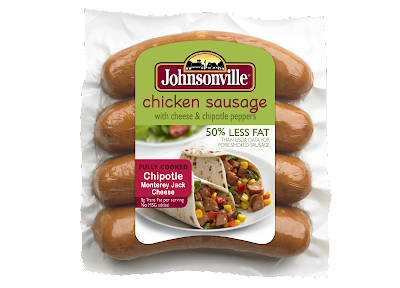 Sprouts/Sunflower Market makes really yummy green chili chicken sausage. 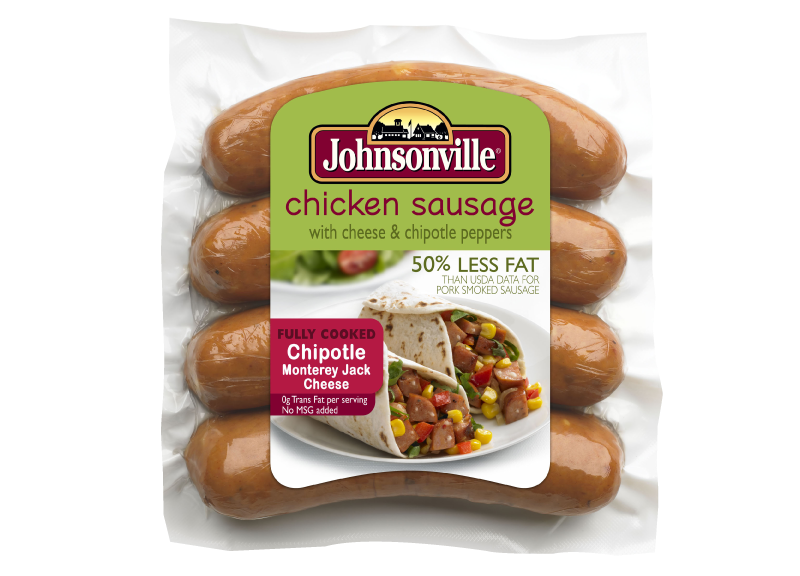 My family also liked this Johnsonville Chipotle Cheese Chicken Sausage. The kids said it was a bit spicy, but it wasn't too bad. 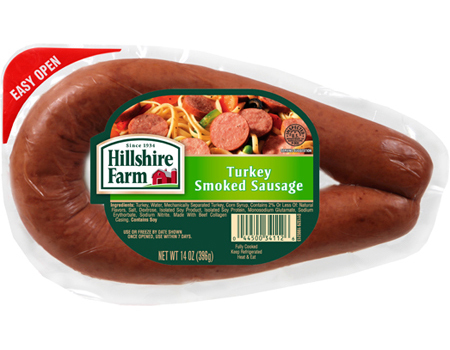 I've also used this Hillshire Farm smoked turkey sausage (which my kids loved), but I missed that chipotle flavor. This recipe is very versatile. 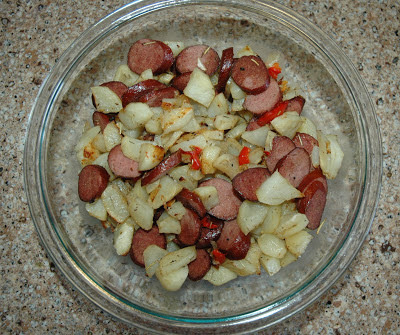 Just use whatever kind of sausage you like and add however many potatoes you think you need and however many onions and peppers you prefer. Enjoy! Preheat oven to 400° F. Cut sausage in 1/4" slices; set aside. 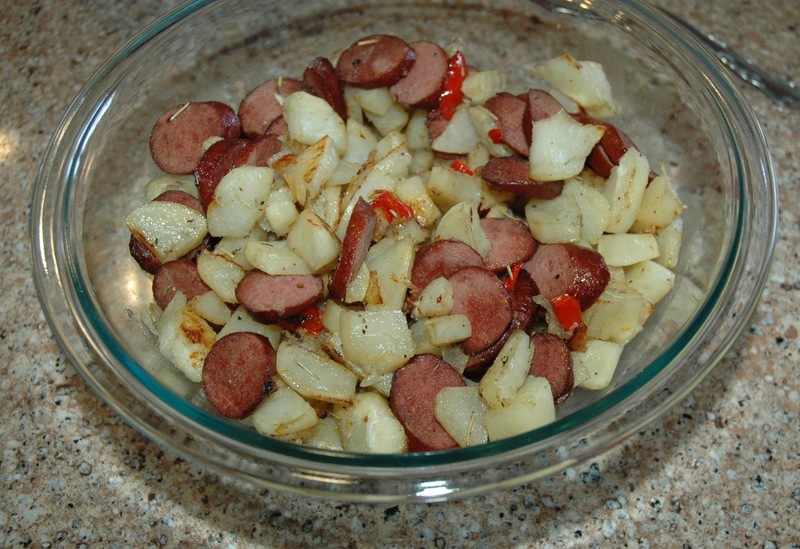 Place potatoes in medium saucepan; cover with water. Bring to a boil; reduce heat. Simmer 10 minutes or until crisp-tender. Drain potatoes. Combine sausage, potatoes, bell peppers, onion, garlic, chicken broth, olive oil and seasonings in a 12x8-inch baking dish; mix lightly. Bake for 30 minutes or until potatoes are lightly browned and vegetables are tender. This is the original recipe (except I used chipotle chicken sausage) with pre-boiled potatoes, baked in chicken broth. Prepare a cookie sheet (18" x 26") with non-stick cooking spray or cover with aluminum foil sprayed with cooking spray. Preheat oven to 425 degrees. Slice peppers 1/4" thick. . Combine peppers, raw potatoes, peppers, onions and garlic with olive oil and seasonings until everything is coated with oil mixture. Spread out in a single layer on a cookie sheet sprayed with non-stick cooking spray or covered in aluminum foil. Bake for 20 minutes. Turn everything over and bake at least 10 minutes more or until potatoes are soft and lightly browned. Or if you have more time, you can bake it at a lower temperature, like 350 and just bake it longer (about an hour) until potatoes are cooked through. This is the easy make ahead smoked turkey sausage, roasted version.